RIO DE JANEIRO, June 25, 2016 (AFP) – A 24-hour restaurant big enough to house jumbo jets, 450,000 condoms, a multi-faith worship centre and beds that extend to accommodate the lankiest of basketball players. They are some of the attractions at the Rio Olympics athletes’ village, which will open its doors in a month’s time ahead of the August 5-21 Games, the first to be staged in Latin America. 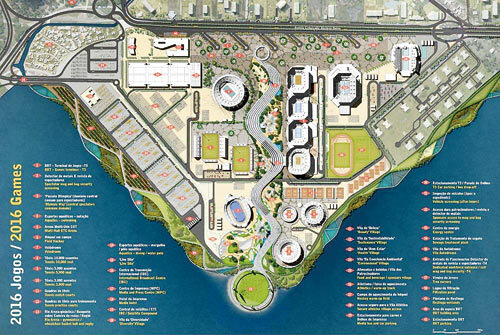 In all, there are 31 buildings which can accommodate up to 18,000 athletes and coaching staff. The walkways between the towers are full of greenery and water features, even if a favela (slum) can just be spotted outside the confines of the 2,909 billion reais (742 million euros/$835 million) project. The village opened its doors to the international media this week. ”Today everything is white but there will be plenty of colours when the 207 national flags are flying along the Carioca,” explained Mario Cilenti, the village executive director, as he pointed to the street bordering the complex. The restaurant is huge with organisers claiming five Airbus A380 planes could be comfortably parked inside it. It will serve 210 tons of food a day to competitors who can take advantage of the 7,000 seats available. Athletes are due to start arriving on July 24. Each of the 207 delegations has the right to have a welcome ceremony presided over by the “mayor” of the village, former basketball star Janeth Arcain, a two-time Olympic medallist. Around 13,000 staff will be based at the village. ”Next week we will have practice drills for potential situations that could arise. We have to be ready for everything,” added Cilenti. There are 3,604 apartments with two, three and four beds. ”They are not luxurious, they are basic but with all that the athletes need for their tranquility and mental preparation,” said Carlos Nuzman, the president of the local organising committee. There will be no televisions in the rooms as a result of the budget being chopped. Screens instead are set up inside communal areas. There are 19,000 beds of two metres in length which can be extended by up to 30cm for the larger athlete. All rooms are equipped with anti-mosquito electronic devices in a reflection of fears over the Zika virus. How can we curb Rugby violence?